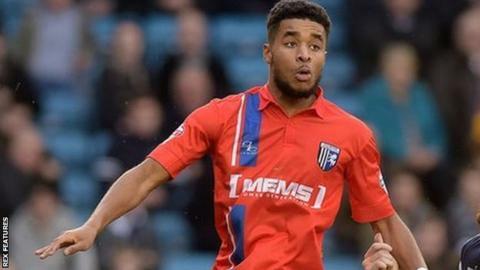 Colchester slipped to their ninth consecutive league defeat as Dominic Samuel won the game for Gillingham. Tom Eastman came close for the visitors in the first half before Gillingham's Jake Hessenthaler shot over the bar. Luke Norris hit the side netting and headed wide after the break as the Gills began to dominate play. Samuel then tapped in John Egan's cross from close range to secure their fourth consecutive league victory and keep them third in the League One table. Match ends, Gillingham 1, Colchester United 0. Second Half ends, Gillingham 1, Colchester United 0. Callum Harriott (Colchester United) wins a free kick in the attacking half. Luke Norris (Gillingham) wins a free kick on the left wing. Foul by Owen Garvan (Colchester United). Attempt saved. Marvin Sordell (Colchester United) right footed shot from the centre of the box is saved in the centre of the goal. Attempt missed. Marvin Sordell (Colchester United) right footed shot from outside the box is too high. Foul by Marvin Sordell (Colchester United). Attempt saved. Marvin Sordell (Colchester United) header from very close range is saved in the centre of the goal. Attempt saved. John Egan (Gillingham) header from the centre of the box is saved in the top centre of the goal. Dominic Samuel (Gillingham) wins a free kick in the attacking half. Substitution, Colchester United. Drey Wright replaces Chris Porter. Substitution, Colchester United. Owen Garvan replaces Joe Edwards. Substitution, Gillingham. Jermaine McGlashan replaces Bradley Dack. Bradley Garmston (Gillingham) is shown the yellow card for a bad foul. Marvin Sordell (Colchester United) wins a free kick on the right wing. Substitution, Colchester United. Callum Harriott replaces Gavin Massey. John Egan (Gillingham) hits the bar with a right footed shot from more than 35 yards. Goal! Gillingham 1, Colchester United 0. Dominic Samuel (Gillingham) right footed shot from very close range to the centre of the goal. Assisted by John Egan. Attempt blocked. Bradley Dack (Gillingham) right footed shot from the centre of the box is blocked. Attempt saved. Bradley Garmston (Gillingham) right footed shot from outside the box is saved in the centre of the goal. Corner, Gillingham. Conceded by Elliot Parish. Attempt blocked. Luke Norris (Gillingham) right footed shot from outside the box is blocked.